Irish documentary filmmakers Phelim McAleer and Ann McElhinney have stirred up trouble before by debunking smug liberal hypocrisy. 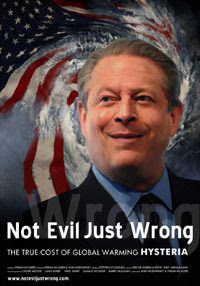 Their latest film, “Not Evil, Just Wrong” takes on the hysteria over global warming and warns that rushing to judgment in combating climate change would threaten the world’s poor. The film reminds us that environmentalists have been wrong in the past, as when they convinced the world to ban the pesticide DDT, costing the lives of countless malaria victims. The ban was finally reversed by the World Health Organization only after decades of debate. The two Irish filmmakers argue that if Al Gore’s advice to radically reduce carbon emissions is followed, it would condemn to poverty two billion people in the world who have yet to turn on their first light switch. Mr. McAleer and Ms. McElhinney have put needles into the pincushions of self-satisfied environmentalists before. In 2007, they produced a documentary called “Mine Your Own Business,” which told the story of a poor village in Romania where environmentalists fought plans for a new gold mine. The village, where unemployment tops 70%, desperately needed the $1 billion in new investment and 600 jobs the project would bring. But environmentalists have blocked it, claiming it would pollute a pristine environment.Mr. McAleer, then a journalist with the Financial Times, considers himself an environmentalist. But when he covered the story for his paper, he says, “I found that almost everything the environmentalists were saying about the project was misleading, exaggerated or quite simply false.” The two filmmakers are skilled at using provocative publicity tactics. On April 22, they will hold a public showing of their film at the Rachel Carson Elementary School in the suburbs of Seattle. “Since it was Rachel Carson who touched off the campaign to ban DDT, we thought showing ‘Not Evil, Just Wrong’ there would be appropriate,” says Mr. McAleer. Local environmentalists will probably not appreciate the gesture and will be appalled that the school agreed to rent out its auditorium to the renegade skeptics. But somebody might point out that it’s not evil, just appropriate, to hold a debate about the real-world consequences of acting on global warming fears.